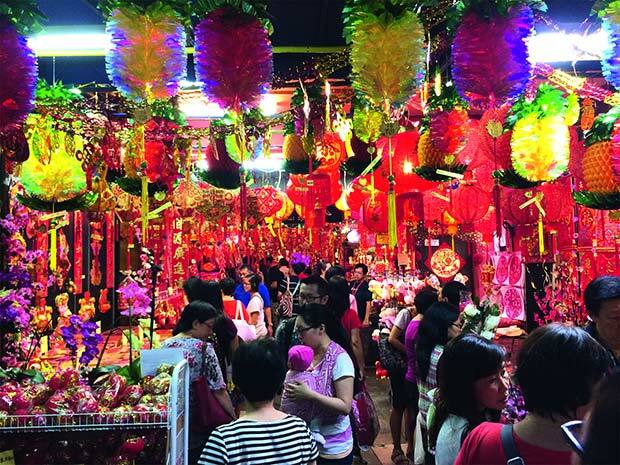 One of Singapore’s biggest deepfreeze warehouses is protected with oxygen reduction made in Germany It all started in the 1980s with a little market stand in Singapore’s Chinatown. warehouses in the city state. The Lee family supplied the residents with fresh fish every day from their small slaughterhouse. The company expanded in the following years and started focusing on selling deep-frozen food products. The company that resulted, Jurong Cold Store (JCS), founded in 1996, now not only runs one of the first automated warehouses in Singapore, it also has its own shrimp farm in the neighbouring country of Indonesia. This way, the company can reliably supply its customers with products of consistent quality. In order to meet the constantly rising demand, Jurong Cold Store established an additional automated deepfreeze warehouse in Singapore under management in the second generation. At 45 m, it is currently one of the tallest warehouses in the region. It began stocking its first products in October 2016 and will be stocked with up to 15,000 pallets of deep-frozen fish and seafood. The warehouse in Singapore faced a special challenge in terms of fire protection. With an area of just 719.2 km² (nearly the same as Hamburg, Germany), space in the island citystate is so tight that a fire in the warehouse would automatically spread to buildings in the immediate vicinity as well. Usually the obligatory sprinkler systems are exploited as fire protection systems in Asia but the company detected that it has too many disadvantages. In its internet research on a possible fire protection solution, JCS came upon the principle of active fire prevention and OxyReduct® technology from the German fire protection expert WAGNER Group with lower investment costs, improved storage capacities, avoiding collateral damage when false alarms were triggered and to avoid damage on storage goods. And so it was that the company came into contact with the WAGNER Group through the consultant on location EDMC and their installer Redlink. The oxygen content in the 76,000 m³ high-bay warehouse is reduced to a level of 16 % vol. using controlled nitrogen supply. The concentration of remaining oxygen was determined based on the individual ignition thresholds of the goods in storage and their packaging materials. This literally deprives a potential fire of the air it needs to breathe while it is just forming, so that it cannot spread or develop further. At the same time, the warehouse remains accessible to authorised personnel. The nitrogen needed for the oxygen reduction is generated on-site by a OxyReduct® system. 76,000 m) high-bay warehouse to 16 % vol. In addition, the high-bay warehouse is monitored by a special deep-freeze version of TITANUS PRO·SENS® air sampling smoke detectors. These enable very early fire detection – and thus immediate initiation of effective countermeasures – yet are immune to false alarms. 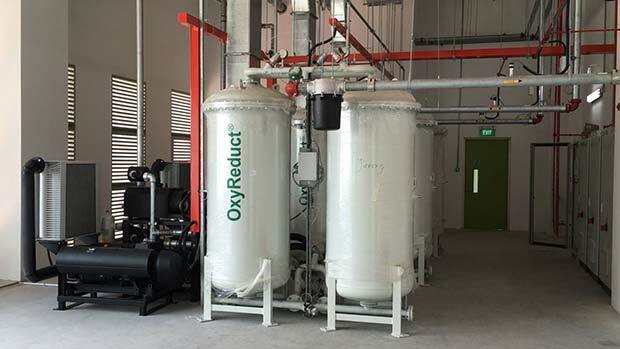 The installation of the first OxyReduct® system in Jurong’s deepfreeze warehouse in Singapore marks WAGNER’s breakthrough into the Asian market. No one paid any attention to active fire prevention at the time the warehouse was planned and constructed. For that reason, the local building authority Civil Defence, in charge of statutory construction provisions, ordinances and building permits, first had to assess the technology’s benefits and mode of operation. This is how Jurong Cold Store obtained the necessary special permit to build the new warehouse. In the meantime, the authority is examining the possibility of adopting the principle of active fire prevention in Singapore’s fire protection regulations. OxyReduct® could thus become a standard solution in the field of storage and logistics. A WAGNER Group branch office is now being established in the citystate of Singapore. Led by Wolfgang van Pels, the team will be the local contact point for customers in Asia. This means that the German technology leader will not only be planning, engineering and constructing systems, but also providing service and maintenance – all from a single source.